The X300 was manufactured from 1995 to 1997. It was the successor to the XJ40 and was the first XJ6 produced entirely under Ford ownership and assembled by automated body welding robots. It can be considered an evolution of the outgoing XJ40 generation. The design of the X300 placed emphasis on improved build quality, improved reliability, and a return to traditional Jaguar styling elements. It had a more curvaceous exterior rather than the flat design of earlier models because of the wrap-around light clusters. The seats were also more curvaceous and wood trim was applied to the instrument panels. There was no glove-box on the earlier X300's due to airbags taking up excess space. A body-colored bumper was installed rather than the previous black-rubber bumper. Only non-european markets received the Jaguar Leaper hood ornament. The X300 was offered with your choice of the AJ16 4.0 liter engine (normally-aspirated or supercharged), and the 6.0 liter V12, both smooth-running engines with distributorless ignition systems. The normally aspirated cars used either a ZF or Getrag four-speed automatic gearbox. The supercharged XJR came with the GM 4L80-E four-speed automatic. All V12 cars were built with the GM 4L80-E automatic. As with earlier luxury sedans, the X300 featured an independent rear suspension arrangement. The X300 was offered in both short and long wheelbase versions. In the U.S., the base model was a short wheelbase chassis, while the Vanden Plas and V12-equipped cars came with the longer wheelbase. The long wheelbase chassis provided approximately six additional inches of rear seat legroom, and an additional inch of headroom. 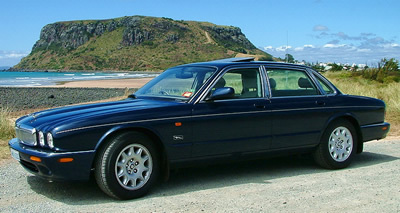 The successor to this car was the V8-powered X308 XJ8. The transition to the V8 engine marked the end of Jaguar's V12 history. We have the most accurate Jaguar parts catalogs on the internet so that you are able to find the correct part for your car every time. Check out our complete line of new and used parts for the X300.